Q. How do I find information on the effects of second hand tobacco smoke? Enter "second hand tobacco smoke" wrapped in double quotes to preserve the search as a phrase. Once on the results page use the filter available to you in the left hand column to narrow down your search. For academic work, click off "Peer Reviewed" under the Content heading. 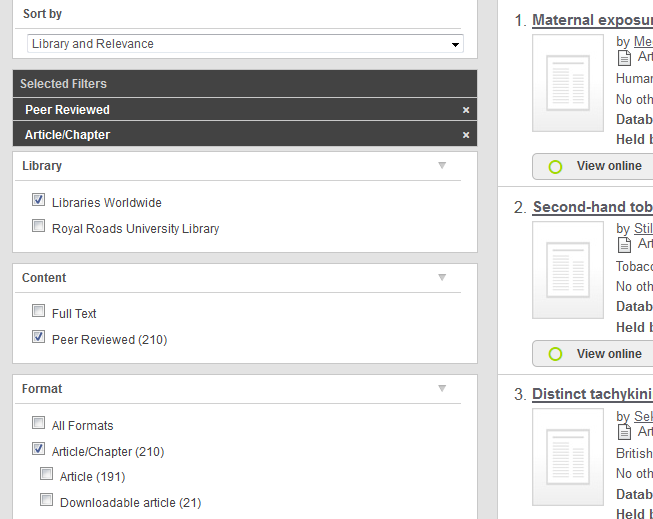 To restrict the results to articles, click off "Article/Chapter" under the Format heading. You can also adjust the date of publication under the Year heading.